Simply contacting the media will not guarantee coverage for your client. You have to persuade the journalist that your story idea is newsworthy. Public relations professionals typically pitch to reporters, editors, bloggers, and social media influencers. 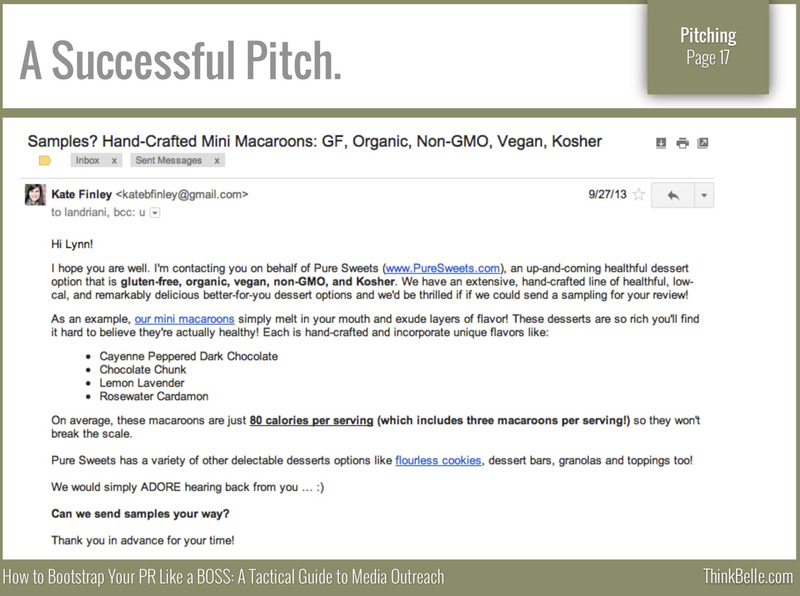 Pitches can take place via email, phone calls, and increasingly through Twitter. The channel you choose for your pitch depends upon the intended individual’s preference. Pitching is a skill that requires creative thinking, persuasive communication skills, and knowing how your story idea benefits the reporter and the audience. Your pitching skills can improve with time and practice. You will feel more confident reaching out to reporters if you write pitches regularly. Before you send an email pitch or call a reporter, it is important to have a solid understanding of your key audience. Carefully examine the interests, preferences, media consumption behaviors, and key demographic information associated with that group. Then you can more accurately select which media outlet will help reach the target audience. Go where your audience is located. For example, as you conduct research about your target audience, you might learn that members read blog posts more than news articles. Therefore, reaching out to bloggers could be more beneficial than targeting news reporters. Place your message or story in media outlets that your intended audience frequently visits or reads. One of the most common complaints from journalists about public relations pitches involves the use of mass emails. Generic pitches sent out to anyone and everyone come across to reporters and bloggers as careless and can compromise your credibility among media professionals. Remember, reporters are going to look at how your story will appeal to their specific readers; therefore, your pitch needs to be strategic. Failure to keep this in mind may result in a rejected pitch or no response at all. Before you pitch to a particular media outlet, be sure to research which specific writer within the organization can help you target your audience. Each reporter covers a different topic, or “beat.” Reading some of a reporter’s previous stories will give you an indication of whether he or she is the right person to cover your story. Let’s say your client is a restaurant that wants to publicize the opening of a new location. A reporter who covers food topics and brands, lifestyle topics, or the restaurant industry would be the most logical choice to write your story. Now that you’ve done your homework on the audience, media outlet, and specific writer, pay close attention to how you craft your pitch message. The subject line is especially important if you’re using email. It needs to be creative enough to catch the attention of the writer; however, avoid exaggerated phrases or visual gimmicks such as all capital letters. Do not use generic headlines such as “Story Idea” or “Cool Upcoming Event.” Try to create a headline similar to one the journalist might use in writing the story. Next, address the reporter or blogger by name and begin the body of the pitch. State why you’re writing, and provide some information about yourself and the company or client you represent. Next, summarize the lead of the story. Writing in this manner resonates with some reporters, as it is the style they are accustomed to. You also can start the email with a catchy line that will hook the journalist, but be careful not to overdo this. Reporters and editors do not like flowery or gimmicky language because it sounds more like a hard sales pitch than a public relations pitch. Continue with the pitch by providing important details about the story and talking about why it would be interesting to the media outlet’s audience. Doing this indicates that the story has news value, which is very important in pitching. Toward the end of the email pitch, state when you would like a response, indicate when you plan to follow up if necessary, and offer specific help. Be sure to thank the reporter or blogger for his or her time. Don’t feel discouraged if the person does not respond immediately. Journalists are extremely busy, and sometimes they simply overlook emails. If necessary, send a reminder email by the follow-up date you mentioned in the first communication. This date depends on when the story should hit the press. If you pitched a story that needs to be published relatively quickly, you may want to follow up no later than two days after sending the initial pitch. If there’s more flexibility in the desired publication date, you may indicate that you will follow up within a week. If the person still does not respond to your pitch, move on to another outlet, reporter, or blogger who can help you accomplish your publicity goals. It is important to also consider timing; for example, do not make a follow-up call at 4:55 p.m. on a Friday when the journalist may be getting ready to head home for the weekend.